The British Gazette » Elephant ? What elephant ? One of the creatures above is an African Elephant. The other is the leader of the Liberal Democrats. 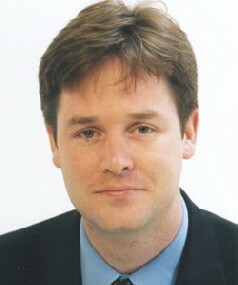 Poor Nick Clegg. The fellow obviously has very poor eyesight. He cannot see an elephant when it is right in front of him. Which is both strange and a pity. 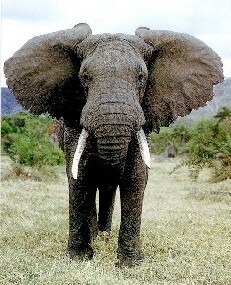 Strange for elephants are among nature’s larger creatures. It can be difficult to spot a small insect, but an elephant ? A pity as elephants can be very dangerous. Getting knocked down by one is something one wants to avoid! The elephant we are talking about of course is Europe – or more accurately the European Union. As many will know, the E.U. is responsible for more than two thirds of the laws in this country. Parliament has no say over these laws. Moreover, governments routinely legislate to comply with EU laws and policy. This was the elephant that Nick did not seem to notice today following the Gracious [Queen’s] Speech when he got up and took the government to task for proposing to introduce legislation requiring future governments to reduce the deficit by 50% over four years. Nick, it was fine oratory referring to the act of getting up early but you are missing something old lad. The government is introducing the legislation as it will be a requirement when the U.K. enters the Eurozone. The British Gazette has warned its readers before about the prospects of this treasonous government putting the country into the Euro when that currency achieves parity with Sterling. This legislation is clearly paving the way for the European Central Bank (ECB) will require this. The ECB has already demanded similar of Ireland which is already in the Eurozone. What else to look out for ? Expect the government to sell off the remaining British Gold Reserves. This time they will at least benefit from a high gold price.